OC-3 Single-Mode To Multi-Mode Converter SC to SC, CFOC2550SC, 100Base FX OC-3 Media Converter from multi mode 2km SC to single mode . Usually ship within 2 business days. 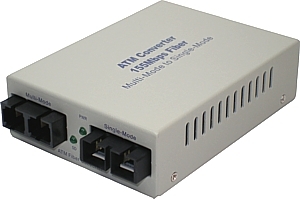 Gigabit Media Single-Mode To Multi-Mode Converter SC to SC, Gigabit Media converter from Multi-mode SC 220m to Single mode SC 10km.